Challenge: The local museum in Morris County was looking for a way to re-energize their existing patrons, and capture a new audience of young professionals. Initial audience research indicated they had a perception problem. Despite the broad range of interesting and cutting-edge exhibits and events that the museum regularly held, the public viewed the museum as a place for the elderly and children. Their branding and communications were seriously out of date, and did not reflect the truly diverse personality of the museum. Solution: Our team conducted research onsite, at other local museums, and via social media networks to determine what the perceptions of the Morris Museum were, what people were looking for in a local destination, and what opportunities were being missed. We conducted stakeholder working sessions to determine the desired perceptions of the museum, and then developed a branding and identity system around the idea that this museum had diverse exhibits unlike any other local museum was created. I developed the tag line "Forget what you know about your local museum. 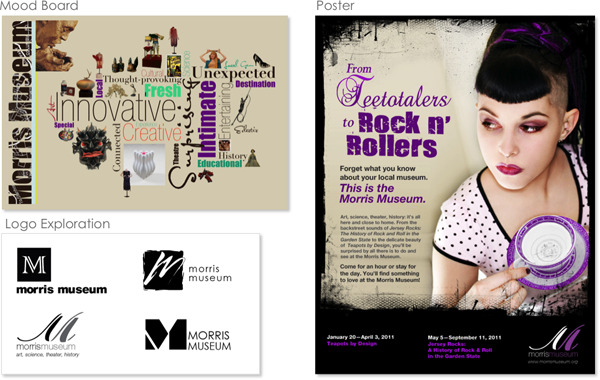 This is the Morris Museum", and my design team created visual branding materials that focused on the juxtaposition of old and new, traditional and modern, classic and cutting-edge that was the strength of what the Morris Museum had to offer.